Cherry Blossoms Stationery Paper by Desktop Publishing Supplies, Inc. is a simple yet beautiful design that can be used for a variety of occasions. This floral design features a pretty cherry blossom branches on the top left and bottom right corners over a beige background with a subtle leaf design. 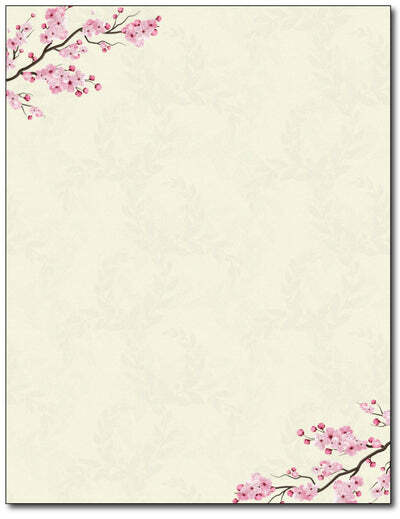 This Cherry Blossom Letterhead works perfect for spring or summer as well as for weddings. The design is sure to impress! Our Cherry Blossom Letterhead is made from an above average 28lb Bond paper stock and measures the standard 8 1/2" x 11" size. The design is featured on the front, while the back is plain white. Both sides of the paper are printable with your inkjet or laser printer or copier.